Throughout the history of the program, countless Chinese have achieved their American dream through investing with the EB-5 program. Whether or not to emigrate and where to immigrate are important decisions that applicants must face to guarantee their family’s happiness. After all, what kind of future does the EB-5 program lead to? Why has the EB-5 program been so popular among so many immigrant investors? To understand the transition that these investors must make, we paid a visit to Ms. Xu, a very happy and successful permanent green card holder. In her description of a meandering journey of the heart, she shares her insight about how the EB-5 program brought changes to her entire family. EB5 Investors: What was it that originally made you want to immigrate to the United States? Ms. Xu: Actually, we never thought that we would emigrate. It was only six years ago that by happenstance we started considering the possibility. At that time, my daughter was in a key secondary school in Guangzhou. The school gave students a lot of opportunities to reach out to the world, and for one summer vacation, she went with classmates on a study tour of the United Kingdom for several weeks. After coming back, she was inspired and told me, “Mom, I hope I can study abroad.” Actually, our plan was to wait until she was in college to send her overseas, but even before then she started asking to go abroad in her freshman year in high school. I told her, alright, we can see what works. So I started looking at a bunch of information online, and my final conclusion was that to be an immigrant investor was our best and fastest choice because we’ve always lived in China and don’t have any relatives overseas. So basically, the choice to emigrate was mainly for my daughter’s education. EB5 Investors: So the application is pretty fast. Is this what interested you the most about the EB-5 program? 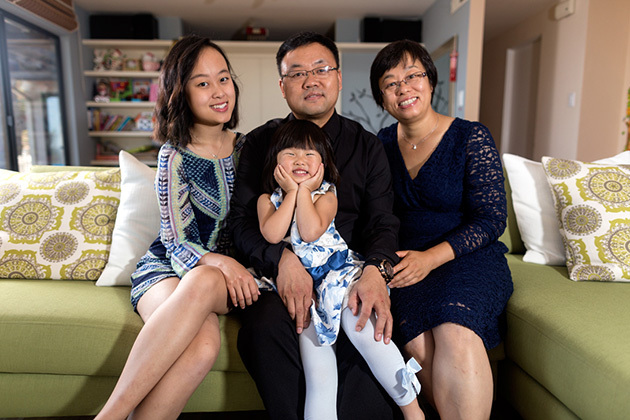 Ms. Xu: This is the main reason, because we hoped to emigrate before my daughter graduated from high school for a smooth transition in terms of her education. After I learned about the EB-5 program online, I started to search for domestic agencies and finally found a company in Guangzhou and participated in their CMB regional center project session. After the session, I was filled with confidence, and I was sure that the EB-5 program was the fastest and most convenient way for a family like ours with a sound economic base and removable funds to immigrate to America. EB5 Investors: What is your personal professional background? Ms. Xu: Originally, my husband and I worked for a government agency, which in China, is to say that we were civil servants. At the time, I had a very stable career, everything had been successful at work, and we had a definite status in society. However, if you talk about our dreams, I really wanted a more comfortable lifestyle without so much outside pressure. At the time, we had wanted our daughter to go abroad on her own, but for a while things weren’t so straightforward, and we thought about whether or not our whole family should emigrate together. Later on, my husband asked me what I thought, and I told him I could leave my job. So, I resigned from my government position and came to America with my daughter. My husband has it pretty rough trying to juggle things in both countries, having to always run back and forth between China and the United States. EB5 Investors: Was it all worth it just for your daughter’s education? Ms. Xu: Yes, this is something I’ve always been happy to share with my friends. The EB-5 program and investing in the regional center project has given our family the greatest gift – our child. Originally, I only had one daughter, but after coming here, God blessed us with a very special gift, my younger daughter. This is something we never could have possibly imagined in terms of a priceless return on investment. Things have gone really well for our older daughter who has done really well in school, all through university. Today, she’s in graduate school. In terms of the cost of education, most of the costs have been cut for us. I feel like the educational resources and the learning environment here really suit her. EB5 Investors: Do you have a background in business? Ms. Xu: No, I don’t. This is also another reason why we chose to invest in the regional center, because we don’t have the ability to just take a sum of money and invest in tangible project management. Not only do we not have this ability, but we also don’t have that kind of energy, so I think that investing in the regional center was our best option. By using the trusteeship approach, you can guarantee the relative safety of your funds. While you can’t be 100% certain, you can at least know that you’ll get your green card quickly and can come to America legitimately. EB5 Investors: What was it that you discussed with the consultant that helped you decide on the regional center? Ms. Xu: Well, the immigration agents provided a lot of help and detailed advice throughout the decision-making process. They used a lot of their technical expertise and past cases to help explain things so that we could fully understand how the project works and how the funds are used. After learning about this stuff, we were pretty confident about selecting the regional center and the project. Even though we didn’t know whether or not future funding would be repaid on time, at least we were confident about the project itself – which is really thanks to the explanations and recommendations that the agents gave us. EB5 Investors: Have you personally visited a project that was under construction? Ms. Xu: Yes, I have. After we received our temporary green cards and came to the United States for the first time, I wanted to go visit the old military airport restoration project that we had invested in up near the Sacramento area. With the agents’ help, we went to visit them and they were really excited to see us. The senior vice president for the project even personally welcomed us to explain the operations of the entire project. They were very responsible, and we were very pleased with what we saw. As far as our mood was concerned, we got to see the actual project, so we were more at ease. After coming back to China, we also told a lot of friends about it and made sure that they knew that this project was legitimate and really did exist. Otherwise, a lot of people probably would have said that we didn’t know what happened to our money. So, to actually get to see the construction progress and the actual blueprint really made us very happy. We had worked in government offices for a very long time, and the procedures for government officials to go overseas are all very strict, so it’s hard to travel abroad through official means. After we got our green cards, things got a lot easier. The first time we traveled overseas, we went to see this project. Afterwards, I could resign without worrying about it too much. EB5 Investors: How long did it take you to get your temporary green card from the time you started making preparations? Ms. Xu: Our family has been pretty lucky, and our agent often uses our case as a model example. It only took four and a half months from the time that we transferred our money into the escrow account until the time when we were given confirmation to travel to the United States. If you add the prep work that we did in advance, it only took us about six months. Originally, we thought we’d have to wait a whole year, but the good news came a lot faster than we expected. I remember that it was around the Spring Festival when we got the news. We were in our hometown when I got a call out of the blue telling me to go to the U.S. Consulate in Guangzhou for our interview. It was really unexpected, and I feel really lucky. I arrived in the United States for the first time on March 5, 2009; by 2011, I already had my permanent green card. Because the regional center’s operations were really sound, the audit process went really quickly. EB5 Investors: All in all, are you happy with your life in America? Ms. Xu: I’m very happy, very blessed. I haven’t worked since my younger daughter was born, and I’ve stayed at home to take care of her. She’s three now and going to preschool. Starting next year, I might start looking for something to do to make my life even more fulfilling. I also want to experience what the job life is like over here. Right now, I’ve started participating in a number of community outreach activities and have done some volunteering. I’m really happy to be able to have the chance to interact with American culture. I’ve told all my friends that immigrating was the best choice in our lives. A lot of people only think about all the things I gave up for my daughter, but I actually should be thanking her. If it weren’t for her asking about studying overseas, I never would have chosen this path, and I’d still be working for the government until I was old enough to retire. Now, I’m ready for a new and different life to begin here in the United States. So, yes, I want to thank my daughter for giving me such a special life experience. EB5 Investors: Where are you living now? What was the main reason for you to come to America instead of some other country? Ms. Xu: I live in San Francisco now, and the weather is always nice. My husband also said he helped me pick out one of the most comfortable places in the world. Actually, when we first decided that we were going to emigrate, we had friends recommend that we move to Canada or Australia, but the main reason we were moving was for our child’s education. Since over a third of the world’s top 100 universities are in America, I felt that this was a better and more competitive learning environment. America is also pretty inclusive, and life here seems to suit us well. We haven’t faced too much oppression or so-called discrimination. EB5 Investors: Were there any aspects throughout the EB-5 application that were particularly difficult? Ms. Xu: I’ve been incredibly lucky. There wasn’t anything that I felt was particularly difficult through the process. Everything has gone as planned, and it’s been wonderful. The agency did a lot of work for us, and we provided all the necessary documents right away. EB5 Investors: Do you have any recommendations for Chinese agents and consultants? Ms. Xu: As far as recommendations go, I’ve done a lot of thinking about this. When I was searching around for information, be it online or elsewhere, a lot of the agencies I came across advocated heavily for certain projects. Don’t exaggerate or create false hope. This was one of the reasons why we were so careful about picking out a good agency. Some of the agencies went a little overboard in trying to convince us with their marketing, but after giving it some time, you have to ask yourself if it’s really as good as they say. Actually, it would be better for agencies to provide honest recommendations and to actually lay out the pros and cons for the customer and let them decide on their own. There are also some media outlets that tend to attack the EB-5 program, and I don’t think that’s fair either. If EB5 Investors could let people see things from a neutral point of view, I’m sure it’ll help a lot of people out. I think that this is something you absolutely have to do. Back when I was trying decide, I searched around for investor stories, and I saw that a lot of people had been scamming investors with EB-5, and it was really frightening. However, after understanding all the ins and outs, I realized that it wasn’t anything like what they were saying. Some people couldn’t even grasp the basic legal ramifications. I hope that your magazine can help others better understand so that they won’t be so afraid to invest. I was repaid our investment funds as scheduled this past July, a whole six months earlier than the deadline, which goes to show that EB-5 can be successful. I was extremely happy and even called the head of the regional center’s customer service to tell them that it really was a perfect ending to an amazing story.